Wondering where to find Boston luggage lockers at the Black Falcon Cruise Terminal, Boston's "CruisePort"? The logical place to find luggage storage lockers would be at the Black Falcon Cruise Terminal where your cruise ship departs and arrives, right? Well, the good news is that you can store your bags short-term at the CruisePort - but only on the day of your cruise. After receiving several questions about luggage storage at the Black Falcon Cruise Terminal and not being able to reach anyone there by phone, I stopped by the terminal, located in the South Boston Waterfront neighborhood, to check out storage locker options myself. A longshoreman gave me the scoop. "No public lockers," he told me, " . . . but no worries if your cruise leaves later in the day. Just bring your bags to the bag check area at the terminal at 10:30am or later, and we'll put them in a storage holding area until time to load them onto your cruise ship." So in other words, although the Cruise Terminal does not provide luggage storage lockers due to security concerns, you can check in early with your bags. Once you've completed that process, your bags will be held for loading. That solution leaves you free to explore Boston bag-free until you check in again for your cruise departure. But . . . what if you arrive from a cruise in the morning, have a flight or train later in the day, and want to store your bags somewhere while you explore the city? More good news. Although neither the CruisePort nor Boston Logan Airport has any public storage lockers available, you can choose from 3 other reasonably convenient options. If you're arriving at Boston Logan Airport, you can find information about luggage storage convenient to the airport here. 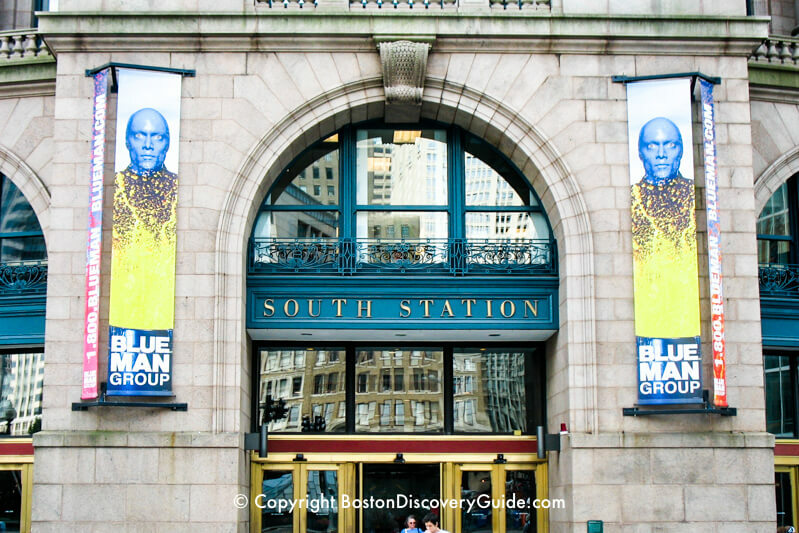 The most convenient place to store luggage near the Black Falcon Cruise Terminal is at South Station because you can easily and cheaply reach it on the Silver Line SL 1 bus (actually part of the Boston subway system because it also goes underground). The Silver Line SL1 bus stops at the Cruise Terminal and will get you to South Station in about 10 minutes. Pay the driver for the fare in cash as you board the bus (check for the current one-way fare) and you'll see the Silver Line stop to the left as you exit the terminal. Alternately, you could take a cab to South Station. If you are traveling with others, the fare may not cost much more on a per-person basis than taking the Silver Line. A taxi is also a good choice if you have too much luggage to manage easily on your own. If you will be taking an Amtrak train from South Station at some later time and have a valid ticket, you can store your luggage for $4 per bag per day in the Amtrak Baggage Room (617-345-7458). Otherwise, go to Level 5 (parking level) of the bus terminal at South Station (700 Atlantic Ave), where you'll find Greyhound Package Express. You can store your luggage with them for $10 per bag for up to 24 hours, within limits of their operating schedule. You will need to pay in cash - but there's an ATM machine in the 1st floor waiting area. Package Express is open 7 days a week (Monday - Friday from 7am to 8pm; Saturday and Sunday from 8am to 5pm; Thanksgiving and Christmas - call ahead for the schedule). Call 617-526-1842 to confirm hours. A third luggage storage option in South Station is Teddy Ballgames, located at the top of the escalator in the main lobby (Monday-Friday, 7am-6pm; Saturday-Sunday, 9am-4pm). Luggage storage is available for a day, overnight, and for multiple days. Call 617-330-1230 to confirm rates and hours. From South Station, you can easily walk up the Rose Kennedy Greenway to Faneuil Hall Marketplace or the North End, stroll into Chinatown for Dim Sum and then explore the nearby Theatre District, or take the subway to, perhaps, Beacon Hill (Red Line/Charles-MGH) for a day of exploring the antique shops and galleries in Beacon Hill. If you're arriving at Boston Logan Airport on the day of your cruise embarkation or leaving from Logan later in the day after your cruise returns to Boston, the easiest way to find a berth for your bags is to take a water taxi to Downtown Boston - specifically, take the Rowes Wharf Water Taxi to their terminal next to the Boston Harbor Hotel on Rowes Wharf, where they offer baggage storage for the day in a locked room to their passengers. 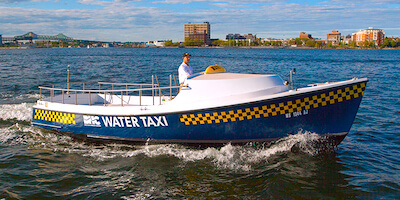 The Rowes Wharf Water Taxi ride to and from Logan International Airport takes only about 7-10 minutes. Fare from the Black Falcon Terminal will run you $20, plus another $12 to or from the airport - but the luggage storage is free if you have a round-trip water taxi ticket and only $8 if you have a 1-way ticket. Call Rowes Wharf Water Taxi at 617-406-8584 for pick-up and to confirm availability of the luggage storage. 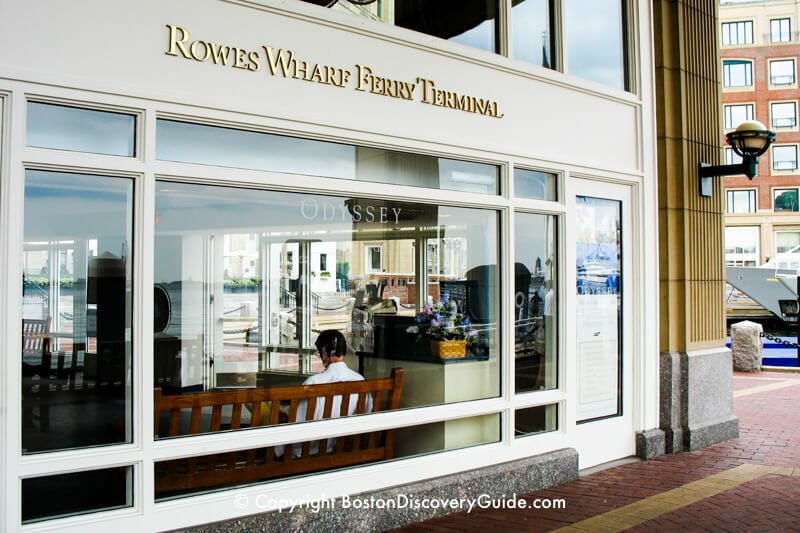 The Rowes Wharf Terminal is on Boston's Harborwalk, which you can walk along to explore the waterfront. Alternately, head over to Historic Downtown Boston, just a few blocks away, where you can walk along the Freedom Trail for more sightseeing. Do you have "road warrior" status with any of the big hotel chains? If neither of the other luggage storage options work for you, a third possibility is find out how much you're valued as a frequent guest by seeing if you can store your bags with them for the day. Best bet is to call the hotel directly, explain that you have "frequent guest" status in their preferred traveler plan, and make your pitch. Make sure you have cash for a good tip. 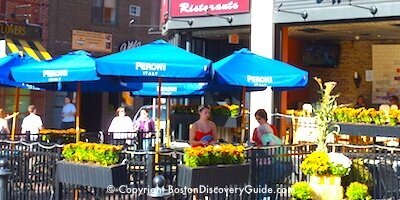 You might start with the South Boston Waterfront hotels located near the Black Falcon Cruise Terminal. 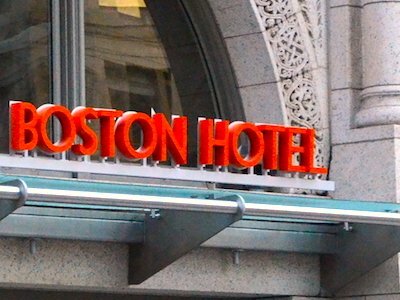 Of course, if you're staying overnight before or after your cruise in a hotel in Boston, you're well positioned to ask that they hold your bags for you before check-in or after check-out time. 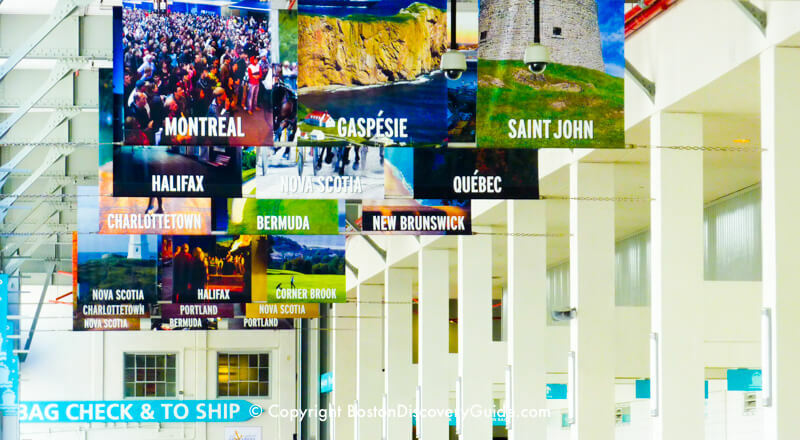 Please note: Although BostonDiscoveryGuide.com does its best to make sure all information is accurate, we can't guarantee it - especially pertaining to luggage options at Black Falcon Cruise Terminal, where all luggage is subject to security precautions. Please do confirm all information that's important to you, and always have a "Plan B" in case things change.